Plan is to combat high rate of fetal alcohol syndrome. camera (Mankato Free Press) Jody Allen Crowe, executive director of Healthy Brains for Children, installed the first-of-its-kind pregnancy test dispenser in the women's restroom at Pub 500 in Mankato, Minn. in 2012. Bars in Alaska will soon offer free pregnancy tests for female customers who want to know if they’re expecting a baby before they start drinking. Pregnancy test dispensers are being installed in the women’s restrooms of 20 bars and restaurants in Alaska. It’s part of a state-funded effort by the University of Alaska to combat fetal alcohol syndrome, according to a report detailing the project. Alaska has the highest rate of the condition in the country. The goal is to target women who don’t know they're pregnant, researchers said. "This isn't targeting chronic alcoholics," said Jody Allen Crowe, founder of the nonprofit Healthy Brains For Children, which launched a similar initiative in 2012 in Minnesota. "Right now 50 percent of pregnancies across the nation are unexpected. This is really focusing on women who are casual drinkers, people who would never drink if they knew they were pregnant." Crowe helped design the program for Alaska. The university will study if women react differently to posters about fetal alcohol syndrome when they are taped to pregnancy test dispensers. Alaska state Sen. Pete Kelly has been a vocal proponent of distributing free pregnancy tests. "They're not that expensive," Kelly told the Anchorage Daily News when he introduced the idea in March. "They're a buck-fifty -- something like that, about two dollars -- per pregnancy test. We're going to get them in mass quantities and distribute them." Kelly added he does not support distributing free birth control in bars. The project has been successful in Minnesota, where tests are available at some bars and restaurants, as well as convenience stores and a youth center, Crowe said. 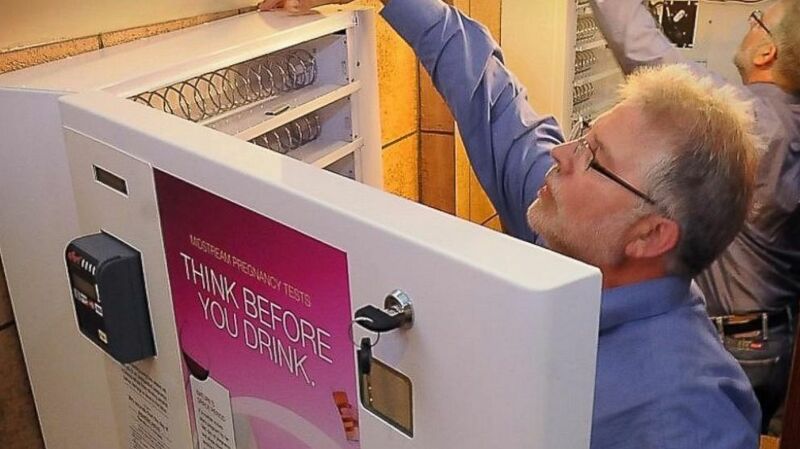 Employees of locations where the pregnancy dispensers are installed say customers are pleased to see the free tests. "We hear positive anecdotes from people," Crowe said. "We're seeing evidence that the message, 'Think before you drink,' is working."